Admit it… we all love our four legged friends with everything we’ve got. It’s okay to spoil them from time to time… at least we like to think so. So while you’re downloading apps to make YOUR life easier, why not download some that will help make life with your furry friend convenient and less worrisome? Here are 7 useful apps for all pet owners out there. Trust us, Fido will thank you! Whether you’re teaching your new puppy to sit and stay or trying to get your adult dog to kick their habit of jumping up on your friends when they come over, iClicker will be your best friend. With the training videos and the touchscreen clicker, you’ll soon have the most well-behaved pooch around. All your friends will be jealous and want to know your secret. You’re making dinner and there’s Fido under your feet sporting the ‘puppy dog eyes’, while searching for scraps and begging for you to drop something, anything. Are you cooking bacon? It’s hard not to give in to that cute face, but pause before you do! Pull up your iKibble app and make sure that what you’re about to feed Fido is safe and healthy. This app is perfect for the cautious pet owner who only wants the very best for their fur baby. It allows you to search a large database of foods and find out their health rating for dogs. Want your pup to try some new, healthy treats or maybe help a pup with an upset stomach? iKibble offers advice on how and when to feed certain foods. The best part: you can mark which foods have been tried and if he liked it or not. That way, next time you’re out grocery shopping, you can make sure to grab Fido’s new favorites too! Fido loves his daily walks and now you can too with Map My Dog Walk! With this app, you’ll get closer to achieving your fitness goals, while making sure that Fido is getting the exercise he needs! The GPS tracker in this app will record your route, pace, distance, and elevation while you walk. The interactive map will tell you how far you’ve gone and exactly where you are (in case you were daydreaming and wandered off your normal route). And if you and Fido like to listen to your favorite jams while you walk, not to worry. You can play your iPod directly from the app! Gone are the days when you’re scrambling to find a pet sitter the night before you’re headed on vacation. From now on, plan to bring Fido with you! After all, Fido deserves a vacation too! With the ability to find pet-friendly hotels or restaurants (usually outdoor seating) wherever you’re headed, you’ll never have to stress about leaving your pet with someone you just met! Worried about finding things to do with your pet when you arrive? Don’t stress, you can even search for pet friendly events and beaches, as well as dog parks and vets through the app. Vacation should be fun for the WHOLE family! Oops! Fido stepped on a bee while you’re on vacation. Now that you’ve used Bring Fido to find an emergency vet, the vet will likely want to see Fido’s records. Be prepared with Pawprint, your one stop shop for digital vet records. 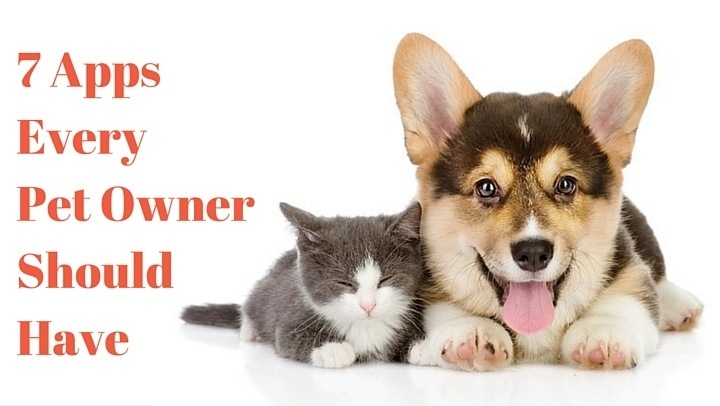 Instead of carrying around a large file of unorganized papers or having to call your vet to get a copy sent over, Pawprint will contact your vet to request a digital copy of the records, which will then be stored in your app for quick and easy access. Pawprint also works great if you’re thinking of boarding Fido or planning to schedule him for a haircut, as most boarders and groomers will want to see copies of his records too. Not only does Pawprint store Fido’s records, it even allows you to make notes and reminders of things to bring up at Fido’s next check up! Whatever the ailment may be, the petMD symptom checker is awesome for both dog and cat owners out there. Whether Fido can’t stop itching or Fifi has lost her appetite, this app will give you access to more than 2000 dog and cat articles that might help you diagnose your pet’s ailment. Of course, this app doesn’t replace the expertise of your pet’s vet. But it can help you determine if time is of the essence. Recommend an app for your fellow pet owners? Let us know!